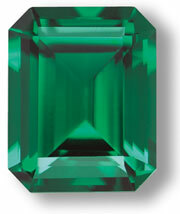 The May birthstone is the highly coveted Emerald. Emeralds vary from light to dark green hues, each beautiful in their own way. What stands out about this gem is that even expensive emeralds are allowed to have eye-visible internal inclusions. Emeralds are formed under such heat and pressure, that the majority of them turn out with inclusions. Because color matters most, the more vivid the shade of the green, the more highly prized the Emerald. Of course, an eye-clean and vividly green Emerald would command a very high price. In fact, carat for carat, very fine Emeralds can be twice as expensive as diamonds. Though quite beautiful, these gems are very soft and fragile. People who are hard on their jewelry may want to consider Emerald earrings or a pendant instead of a ring. Any way that you wear them, though, they are certain to make a striking addition to your jewelry wardrobe. Today, most emeralds are mined in Columbia. Other mines include those in Zambia, Brazil, Zimbabwe, Madagascar, Pakistan, India, Afghanistan, and Russia.